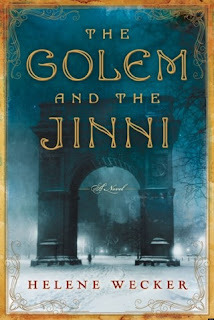 Helene Wecker’s “The Golem and The Jinni” is a rare combination of historical romance meets magical realism. This 400+ page tome is well worth the time investment. I was sorry when I finished reading it. lonely man who dies on the boat as their ship nears America. Because it is her nature to serve, the golem, Chava, struggles without a master. Set adrift in this unfamiliar land, the golem seeks and finds solace as a kind of daughter to an old rabbi. At about the same time, a tinsmith repairs a bottle and releases a jinni. The jinni, Ahmand, trapped for centuries, craves reckless freedom. He roams the city like the fire he’s made from—wildly, quickly, without thought to consequence. The golem and the jinni are simultaneously powerful and vulnerable as they stumble through their new, confusing community. When they meet, they recognize each other as something other than human. An unlikely friendship forms. And while they are both magical creatures, they possess thoughts and feelings that make them real, likeable and complex. The novel employs a wide cast of characters—the rabbi who takes in the lost golem, the tinsmith for whom the jinni works, an ice cream seller who was once a doctor, a man who runs a homeless shelter, all of whom struggle with desires and obstacles. Wecker throws out a multitude of threads and then, like a magician herself, weaves them seamlessly into a story. The plot only really gets going when the evil wizard who created the golem, Yedudah Schaalman, arrives in New York on a quest for eternal life. Here, the golem and the jinni must work together toward a common goal. If you’re looking for a plot-driven novel, this isn’t for you. But, if you’re willing to meander the streets of historical New York with two unconventional guides, this book is well worth your time.